On-going technological advancements have led to dramatic increases in the amounts of biological data being generated. Along with the evolution of high performance computing and computational tools, this has provided us with a wealth of information, analytical power and the opportunity to investigate fundamental health and biotechnological problems of a different magnitude and kind, complementary to and able to guide conventional approaches. Our group is interested in developing and experimentally validating novel computational methods to exploit this data, enhancing the impact of genome sequencing, structural genomics, and functional genomics on biology and medicine. Small molecule activity and toxicity as an aid to the design of novel drugs. 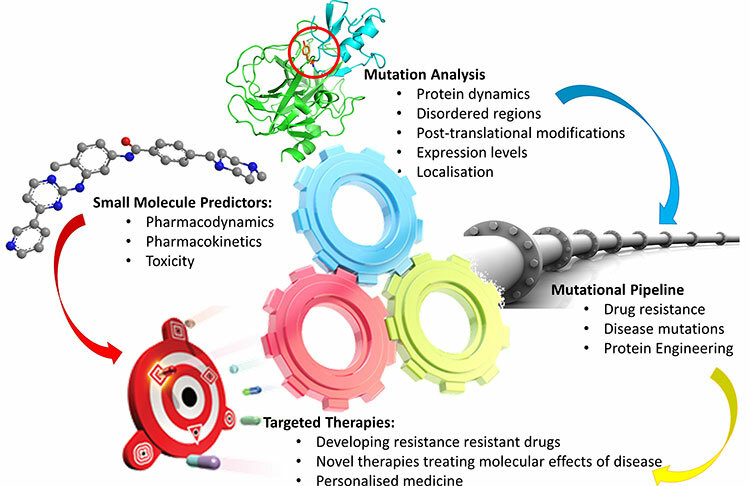 Keywords: Machine learning, databases, mutations, genetic disease, drug resistance, cancer, molecular mechanism, homology modelling, protein structure and function, small molecules, drug development. Arpeggio: Calculation and visualisation of all molecular interactions. MTR Viewer: Quantification of the extent of localized purifying selection in protein-coding sequences. mCSM-Stability: Predicting effects of mutations on protein stability. DUET: An integrated method for predicting effects of mutations on protein stability. SDM2: An optimised knowledge based method for predicting effects of mutations on protein stability. mCSM-PPI: Predicting effects of mutations on the affinity of protein-protein interactions. mCSM-AB: Predicting effects of mutations on antibody-antigen binding affinity. mCSM-NA: Predicting effects of mutations on the affinity of protein-nucleic acid interactions. mCSM-NAv2: Optimised predictions of the effects of mutations on the affinity of protein-nucleic acid interactions. mCSM-lig: Predicting effects of protein mutations on affinity for small molecules. CSM-lig: Predicting the protein binding affinity of small molecules. Kinact: Identification of protein kinase activating mutations. pkCSM: Predicting small molecule pharmacokinetic and toxicity properties. Platinum DB: Structural database of experimentally measured effects of missense mutations on protein-ligand complexes. TROMBONE DB: Optimisation of Botulinum and Tetnus neurotoxins for medicinal purposes. Symphony DB: Classification of VHL missense mutations according to risk of clear cell Renal carcinoma. Newton Fund/MRC: "Understanding Antimicrobial Resistance Mutations in Tuberculosis: Towards Personalised Treatment to Combat Multi‐drug Resistance". 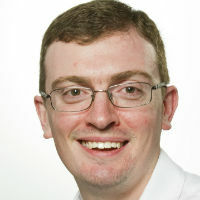 Jack Brockhoff Foundation Grant: “Understanding the Molecular Mechanisms of Complex Mutations”. Click here for the results of a PubMed search of David's publications. Click here for the results of a Google Scholar analysis of David's publications. Sibanda, BL, Chirgadze, DY, Ascher, DB, Blundell, TL. DNA-PKcs structure suggests an allosteric mechanism modulating DNA double-strand break repair. Science 2017; 355(6324): 520-524. Jubb, HC, Higueruelo, AP, Ochoa-Montano, B, Pitt, WR, Ascher, DB, Blundell, TL. Arpeggio: A Web Server for Calculating and Visualising Interatomic Interactions in Protein Structures. J Mol Biol 2017; 429(3): 365-371. Pires DEV, Chen J, Blundell TL, Ascher DB. In silico functional dissection of saturation mutagenesis: Interpreting the relationship between phenotypes and changes in protein stability, interactions and activity. Scientific Reports 2016; 6: 19848. Pires DEV, Blundell TL, Ascher DB. mCSM-lig: quantifying the effects of mutations on protein-ligand affinity in genetic disease and the emergence of drug resistance. Scientific Reports 2016; 6: 29575. Pires DEV, Blundell TL, Ascher DB. pkCSM: predicting small-molecule pharmacokinetic properties using graph-based signatures. Journal of Medicinal Chemistry 2015; 58(9): 4066-4072. Phelan J, Coll F, McNerney R, Ascher DB, Pires DE, Furnham N, Coeck N, Hill-Cawthorne GA, Nair MB, Mallard K, Ramsay A, Campino S, Hibberd ML, Pain A, Rigouts L, Clark TG. Mycobacterium tuberculosis whole genome sequencing and protein structure modelling provides insights into anti-tuberculosis drug resistance. BMC Medicine 2016; 14: 31. Jafri M, Wake NC, Ascher DB, Pires DEV, Gentle D, Morris MR, Rattenberry E, Simpson MA, Trembath RC, Weber A, Woodward ER, Donaldson A, Blundell TL, Latif F, Maher ER. Germline Mutations in the CDKN2B tumor suppressor gene predispose to renal cell carcinoma. Cancer Discovery 2015; 5(7): 723-729. Jubb H, Blundell TL, Ascher DB. Flexibility and small pockets at protein-protein interfaces: new insights into druggability. Progress in Biophysics and Molecular Biology 2015; 119(1): 2-9. Pires DEV, Ascher DB, Blundell TL. mCSM: predicting the effect of mutations in proteins using graph-based signatures. Bioinformatics 2014; 30(3): 335-342. Ascher DB, Wielens J, Nero TL, Morton CJ, Parker MW. Potent hepatitis C inhibitors bind directly to NS5A and reduce its affinity for RNA. Scientific Reports 2014; 4: 4765.